Dysferlin also known as dystrophy-associated fer-1-like protein is a protein that in humans is encoded by the DYSF gene. Dysferlin is linked with skeletal muscle repair. A defect in the DYSF gene, located on chromosome 2p12-14, results in several types of muscular dystrophy; including Miyoshi myopathy (MM), Limb-girdle muscular dystrophy type 2B (LGMD2B) and Distal Myopathy (DM). A reduction or absence of dysferlin, termed dysferlinopathy, usually becomes apparent in the third or fourth decade of life and is characterised by weakness and wasting of various voluntary skeletal muscles. 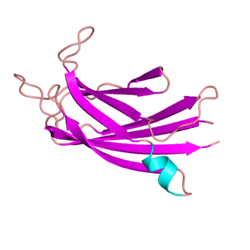 The dysferlin protein is a roughly 220 kilodalton type-II transmembrane protein. It contains a large intracellular cytoplasmic N-terminal domain, an extreme C-terminal transmembrane domain, and a short C-terminal extracellular domain. The cytosolic domain of dysferlin is composed of 6 highly conserved C2 domains (C2A-F) which are conserved across several proteins within the ferlin family, including dysferlin homolog myoferlin. In fact, the C2 domain at any given position is more similar to the C2 domain at the corresponding position within other ferlin family members than the adjacent C2 domain within the same protein. This suggests that each individual C2 domain may in fact play a specific role in dysferlin function. A crystal structure of the C2A domain of dysferlin has been solved, and reveals that the C2A domain changes conformation when interacting with calcium ions, which is consistent with a growing body of evidence suggesting that the C2A domain plays a role in calcium-dependent lipid binding. In addition to the C2 domains, dysferlin also contains "Fer" and "Dysf" domains of largely unknown function. The most intensively studied role for dysferlin is in a cellular process called membrane repair. Membrane repair is a critical mechanism by which cells are able to seal dramatic wounds to the plasma membrane. Muscle is thought to be particularly prone to membrane wounds given that muscle cells transmit high force and undergo cycles of contraction. Dysferlin is highly expressed in muscle, and is homologous to the ferlin family of proteins, which are thought to regulate membrane fusion across a wide variety of species and cell types. Several lines of evidence suggest that dysferlin may be involved in membrane repair in muscle. First, dysferlin-deficient muscle fibers show accumulation of vesicles (which are critical for membrane repair in non-muscle cell types) near membrane lesions, indicating that dysferlin may be required for fusion of repair vesicles with the plasma membrane. Further, dysferlin-deficient muscle fibers take up extracellular dyes to a greater extent than wild-type muscle fibers following laser-induced wounding in-vitro. Dysferlin is also markedly enriched at membrane lesions with several additional proteins thought to be involved in membrane resealing, including annexin and MG53. Exactly how dysferlin contributes to membrane resealing is not clear, but biochemical evidence indicates that dysferlin may bind lipids in a calcium-dependent manner, consistent with a role for dysferlin in regulating fusion of repair vesicles with the sarcolemma during membrane repair. Furthermore, live-cell imaging of dysferlin-eGFP expressing myotubes indicates that dysferlin localizes to a cellular compartment that responds to injury by forming large dysferlin-containing vesicles, and formation of these vesicles may contribute to wound repair. Dysferlin has been shown to interact with Caveolin 3 in skeletal muscle., and this interaction is thought to retain dysferlin within the plasma membrane. Dysferlin also interacts with MG53, and a functional interaction between dysferlin, caveolin-3 and MG53 is thought to be critical for membrane repair in skeletal muscle. ↑ Passos-Bueno MR, Richard I, Vainzof M, Fougerousse F, Weissenbach J, Broux O, Cohen D, Akiyama J, Marie SK, Carvalho AA (May 1993). "Evidence of genetic heterogeneity in the autosomal recessive adult forms of limb-girdle muscular dystrophy following linkage analysis with 15q probes in Brazilian families". J. Med. Genet. 30 (5): 385–7. doi:10.1136/jmg.30.5.385. PMC 1016373 . PMID 8320700. ↑ "Entrez Gene: DYSF dysferlin, limb girdle muscular dystrophy 2B (autosomal recessive)". ↑ Leiden University Medical Center, Center for Human and Clinical Genetics - Dysferlin Retrieved 21 June 2007. ↑ Vafiadaki E, Reis A, Keers S, Harrison R, Anderson LV, Raffelsberger T, Ivanova S, Hoger H, Bittner RE, Bushby K, Bashir R (2001). "Cloning of the mouse dysferlin gene and genomic characterization of the SJL-Dysf mutation". NeuroReport. 12 (3): 625–9. doi:10.1097/00001756-200103050-00039. PMID 11234777. ↑ Fuson K, Rice A, Mahling R, Snow A, Nayak K, Shanbhogue P, Meyer AG, Redpath GM, Hinderliter A, Cooper ST, Sutton RB (2014). "Alternate splicing of dysferlin C2A confers Ca²⁺-dependent and Ca²⁺-independent binding for membrane repair". Structure. 22 (1): 104–15. doi:10.1016/j.str.2013.10.001. PMID 24239457. ↑ Therrien C, Di Fulvio S, Pickles S, Sinnreich M (2009). "Characterization of lipid binding specificities of dysferlin C2 domains reveals novel interactions with phosphoinositides". Biochemistry. 48 (11): 2377–84. doi:10.1021/bi802242r. PMID 19253956. ↑ Bashir R, Britton S, Strachan T, Keers S, Vafiadaki E, Lako M, Richard I, Marchand S, Bourg N, Argov Z, Sadeh M, Mahjneh I, Marconi G, Passos-Bueno MR, Moreira Ede S, Zatz M, Beckmann JS, Bushby K (1998). "A gene related to Caenorhabditis elegans spermatogenesis factor fer-1 is mutated in limb-girdle muscular dystrophy type 2B". Nat. Genet. 20 (1): 37–42. doi:10.1038/1689. PMID 9731527. ↑ Bansal D, Miyake K, Vogel SS, Groh S, Chen CC, Williamson R, McNeil PL, Campbell KP (2003). "Defective membrane repair in dysferlin-deficient muscular dystrophy". Nature. 423 (6936): 168–72. doi:10.1038/nature01573. PMID 12736685. ↑ Roostalu U, Strähle U (2012). "In vivo imaging of molecular interactions at damaged sarcolemma". Dev. Cell. 22 (3): 515–29. doi:10.1016/j.devcel.2011.12.008. PMID 22421042. ↑ Abdullah N, Padmanarayana M, Marty NJ, Johnson CP (2014). "Quantitation of the calcium and membrane binding properties of the C2 domains of dysferlin". Biophys. J. 106 (2): 382–9. doi:10.1016/j.bpj.2013.11.4492. PMID 24461013. ↑ McDade JR, Michele DE (2014). "Membrane damage-induced vesicle-vesicle fusion of dysferlin-containing vesicles in muscle cells requires microtubules and kinesin". Hum. Mol. Genet. 23 (7): 1677–86. doi:10.1093/hmg/ddt557. PMID 24203699. ↑ Matsuda C, Hayashi YK, Ogawa M, Aoki M, Murayama K, Nishino I, Nonaka I, Arahata K, Brown RH (August 2001). "The sarcolemmal proteins dysferlin and caveolin-3 interact in skeletal muscle". Hum. Mol. Genet. 10 (17): 1761–6. doi:10.1093/hmg/10.17.1761. PMID 11532985. ↑ Hernández-Deviez DJ, Howes MT, Laval SH, Bushby K, Hancock JF, Parton RG (2008). "Caveolin regulates endocytosis of the muscle repair protein, dysferlin". J. Biol. Chem. 283 (10): 6476–88. doi:10.1074/jbc.M708776200. PMID 18096699. ↑ Cai C, Weisleder N, Ko JK, Komazaki S, Sunada Y, Nishi M, Takeshima H, Ma J (2009). "Membrane repair defects in muscular dystrophy are linked to altered interaction between MG53, caveolin-3, and dysferlin". J. Biol. Chem. 284 (23): 15894–902. doi:10.1074/jbc.M109.009589. PMC 2708885 . PMID 19380584. Bejaoui K, Hirabayashi K, Hentati F, Haines JL, Ben Hamida C, Belal S, Miller RG, McKenna-Yasek D, Weissenbach J, Rowland LP (1995). "Linkage of Miyoshi myopathy (distal autosomal recessive muscular dystrophy) locus to chromosome 2p12-14". Neurology. 45 (4): 768–72. doi:10.1212/wnl.45.4.768. PMID 7723968. Bashir R, Strachan T, Keers S, Stephenson A, Mahjneh I, Marconi G, Nashef L, Bushby KM (1994). "A gene for autosomal recessive limb-girdle muscular dystrophy maps to chromosome 2p". Hum. Mol. Genet. 3 (3): 455–7. doi:10.1093/hmg/3.3.455. PMID 8012357. Liu J, Aoki M, Illa I, Wu C, Fardeau M, Angelini C, Serrano C, Urtizberea JA, Hentati F, Hamida MB, Bohlega S, Culper EJ, Amato AA, Bossie K, Oeltjen J, Bejaoui K, McKenna-Yasek D, Hosler BA, Schurr E, Arahata K, de Jong PJ, Brown RH (1998). "Dysferlin, a novel skeletal muscle gene, is mutated in Miyoshi myopathy and limb girdle muscular dystrophy". Nat. Genet. 20 (1): 31–6. doi:10.1038/1682. PMID 9731526. Bashir R, Britton S, Strachan T, Keers S, Vafiadaki E, Lako M, Richard I, Marchand S, Bourg N, Argov Z, Sadeh M, Mahjneh I, Marconi G, Passos-Bueno MR, Moreira Ede S, Zatz M, Beckmann JS, Bushby K (1998). "A gene related to Caenorhabditis elegans spermatogenesis factor fer-1 is mutated in limb-girdle muscular dystrophy type 2B". Nat. Genet. 20 (1): 37–42. doi:10.1038/1689. PMID 9731527. Anderson LV, Davison K, Moss JA, Young C, Cullen MJ, Walsh J, Johnson MA, Bashir R, Britton S, Keers S, Argov Z, Mahjneh I, Fougerousse F, Beckmann JS, Bushby KM (1999). "Dysferlin is a plasma membrane protein and is expressed early in human development". Hum. Mol. Genet. 8 (5): 855–61. doi:10.1093/hmg/8.5.855. PMID 10196375. Weiler T, Bashir R, Anderson LV, Davison K, Moss JA, Britton S, Nylen E, Keers S, Vafiadaki E, Greenberg CR, Bushby CR, Wrogemann K (1999). "Identical mutation in patients with limb girdle muscular dystrophy type 2B or Miyoshi myopathy suggests a role for modifier gene(s)". Hum. Mol. Genet. 8 (5): 871–7. doi:10.1093/hmg/8.5.871. PMID 10196377. Matsuda C, Aoki M, Hayashi YK, Ho MF, Arahata K, Brown RH (1999). "Dysferlin is a surface membrane-associated protein that is absent in Miyoshi myopathy". Neurology. 53 (5): 1119–22. doi:10.1212/wnl.53.5.1119. PMID 10496277. Illa I, Serrano-Munuera C, Gallardo E, Lasa A, Rojas-García R, Palmer J, Gallano P, Baiget M, Matsuda C, Brown RH (2001). "Distal anterior compartment myopathy: a dysferlin mutation causing a new muscular dystrophy phenotype". Ann. Neurol. 49 (1): 130–4. doi:10.1002/1531-8249(200101)49:1<130::AID-ANA22>3.0.CO;2-0. PMID 11198284. Aoki M, Liu J, Richard I, Bashir R, Britton S, Keers SM, Oeltjen J, Brown HE, Marchand S, Bourg N, Beley C, McKenna-Yasek D, Arahata K, Bohlega S, Cupler E, Illa I, Majneh I, Barohn RJ, Urtizberea JA, Fardeau M, Amato A, Angelini C, Bushby K, Beckmann JS, Brown RH (2001). "Genomic organization of the dysferlin gene and novel mutations in Miyoshi myopathy". Neurology. 57 (2): 271–8. doi:10.1212/wnl.57.2.271. PMID 11468312. Matsuda C, Hayashi YK, Ogawa M, Aoki M, Murayama K, Nishino I, Nonaka I, Arahata K, Brown RH (2001). "The sarcolemmal proteins dysferlin and caveolin-3 interact in skeletal muscle". Hum. Mol. Genet. 10 (17): 1761–6. doi:10.1093/hmg/10.17.1761. PMID 11532985. Ikezoe K, Furuya H, Ohyagi Y, Osoegawa M, Nishino I, Nonaka I, Kira J (2003). "Dysferlin expression in tubular aggregates: their possible relationship to endoplasmic reticulum stress". Acta Neuropathol. 105 (6): 603–9. doi:10.1007/s00401-003-0686-1. PMID 12664320.
von Tell D, Bruder CE, Anderson LV, Anvret M, Ahlberg G (2003). "Refined mapping of the Welander distal myopathy region on chromosome 2p13 positions the new candidate region telomeric of the DYSF locus". Neurogenetics. 4 (4): 173–7. doi:10.1007/s10048-003-0154-z. PMID 12836053. Lennon NJ, Kho A, Bacskai BJ, Perlmutter SL, Hyman BT, Brown RH (2003). "Dysferlin interacts with annexins A1 and A2 and mediates sarcolemmal wound-healing". J. Biol. Chem. 278 (50): 50466–73. doi:10.1074/jbc.M307247200. PMID 14506282. Katz JS, Rando TA, Barohn RJ, Saperstein DS, Jackson CE, Wicklund M, Amato AA (2003). "Late-onset distal muscular dystrophy affecting the posterior calves". Muscle Nerve. 28 (4): 443–8. doi:10.1002/mus.10458. PMID 14506716. Confalonieri P, Oliva L, Andreetta F, Lorenzoni R, Dassi P, Mariani E, Morandi L, Mora M, Cornelio F, Mantegazza R (2003). "Muscle inflammation and MHC class I up-regulation in muscular dystrophy with lack of dysferlin: an immunopathological study". J. Neuroimmunol. 142 (1-2): 130–6. doi:10.1016/S0165-5728(03)00255-8. PMID 14512171. Foxton RM, Laval SH, Bushby KM (2004). "Characterisation of the dysferlin skeletal muscle promoter". Eur. J. Hum. Genet. 12 (2): 127–31. doi:10.1038/sj.ejhg.5201092. PMID 14560310. Cagliani R, Fortunato F, Giorda R, Rodolico C, Bonaglia MC, Sironi M, D'Angelo MG, Prelle A, Locatelli F, Toscano A, Bresolin N, Comi GP (2003). "Molecular analysis of LGMD-2B and MM patients: identification of novel DYSF mutations and possible founder effect in the Italian population". Neuromuscul. Disord. 13 (10): 788–95. doi:10.1016/S0960-8966(03)00133-0. PMID 14678801. Capanni C, Sabatelli P, Mattioli E, Ognibene A, Columbaro M, Lattanzi G, Merlini L, Minetti C, Maraldi NM, Squarzoni S (2003). "Dysferlin in a hyperCKaemic patient with caveolin 3 mutation and in C2C12 cells after p38 MAP kinase inhibition". Exp. Mol. Med. 35 (6): 538–44. doi:10.1038/emm.2003.70. PMID 14749532. Brüss M, Homann J, Molderings GJ (2004). "[Dysferlinopathy as an extrahepatic cause for the elevation of serum transaminases]". Med. Klin. (Munich). 99 (6): 326–9. doi:10.1007/s00063-004-1046-1. PMID 15221058. Huang Y, de Morrée A, van Remoortere A, Bushby K, Frants RR, den Dunnen JT, van der Maarel SM (2008). "Calpain 3 is a modulator of the dysferlin protein complex in skeletal muscle". Hum. Mol. Genet. 17 (12): 1855–66. doi:10.1093/hmg/ddn081. PMC 2900895 . PMID 18334579. The Jain Foundation is focused on finding a cure for dysferlin deficiency. The foundation is sponsoring targeted research and helping to educate patients on the importance of determining the mutations they carry in their dysferlin gene.